It's easy for Starkville drivers to take power steering for granted – you spin the steering wheel and your car turns. But behind the scenes your power steering is making it easy. The vast majority of vehicles on Artesia roads have hydraulic power steering systems, which means that pressurized fluid is used to help you do the work of steering. A pump pressurizes the power steering fluid to provide the boost you need. 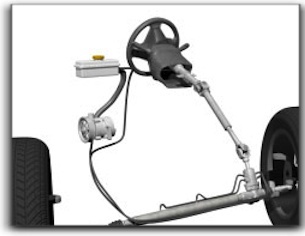 In some Starkville vehicles the pump is driven by the serpentine belt, while in others there is an electric pump. The problem for Starkville vehicles is that over time, the fluid becomes contaminated and can actually cause leaks in the hoses and connections. It gets harder to steer and could even cause total failure of the power steering system. Periodically, your friendly and knowledgeable City Alignment Service service advisor may recommend you change transmission fluid, which involves removing the old, dirty fluid and replacing with fresh fluid. This helps the power steering components last longer, maintains your vehicle's steering performance and keeps you safely on the road in Starkville. Your City Alignment Service technician will also have your system checked for leaks and the belt inspected for other pending needs. Ask if it's time to perform a power steering service on your vehicle today.